Instructor User Guide Rich Text EditorHow do I add special characters to a text box? Position your cursor where you want to insert the special character or diacritical mark. Click the Insert Special Characters icon. This displays the Select Special Character box. 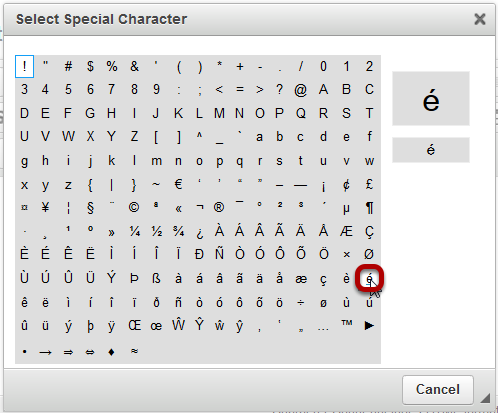 Select the special character or diacritical mark you want to insert. The special character / diacritical mark will now be displayed in the text box. Prev: How do I embed a YouTube video in a text box? Next: How do I add/edit a table in a text box?